Language is a tool of communication between individuals forming a certain community. It is also a system that creates social reality. Individuals must learn and use a language to enter reality and belong to the community. Language is a tool and an imposition at the same time. When the community is replaced by a society ruled by interests alien to the common good, breaking the language might be regarded as a tactic to get rid of unfair impositions. Does fragmented language create a new reality or does it avoid the possibility for thinking any new structures? Does it serve prevalent political orders? In the past, many artists tried to break the language with the aim of clearing the ground and preparing it for new constructions or just producing a new language for a new community. We can discuss the ingenuity of trying to change reality through the individual operation on language. But the fact is that we don’t need to break language anymore, because it is already broken in many ways. There has been a long debate on the social and political consequences of the fragmentation of language, related to the use of new media, the spread of functional English and the intertwining of different languages and codes. And we could start from “pain” of language, when one feels uncomfortable, when one speaks a foreign/or a second language and it starts to feel like a synthetic new tooth, not really physically part of the self… When one feels language falls short of defining what one wants to communicate, when it starts fading into stutters and ers and uhs… Some questions arise… Does learning a “legitimate”, “normative”, “classical” language save us from this pain? But doesn’t a classical language that holds with it rules and order force us to speak in a certain way? Doesn’t it subjugate and alien it us? But what about a fragmented language that defies order and frees one of binding linguistic rules and allows one to play? But, hasn’t this been used up by advertising, and a capitalist system? Doesn’t it produce jargons and social groups that exclude? What about “clarity”, and the language of law that supposedly makes up a society, how does it function? What about the political language of manifestos and resolutions? How does language function in different cases? What is its relationship with the body? With the formation of society? With the image? Because we have so many questions, we need to talk. And this conversation about language needs to run through different media and the contribution of many voices. At a certain point, action may be more meaningful than words. So why not conceive language as an action, the action of writing, speaking or reading, and not only as a frame or as the substance of the text? And why not thinking of art itself as action: the action of producing forms, playing with ideas and materials, involving people in aesthetic games? Then we realize it is not only a question of media, it is not only a question of language, but above all, a question of practice. This small text was written as an exchange between Jerusalem, Beirut and Madrid, partially thought in Arabic and Spanish, written in English and then translated into Arabic (and perhaps also into Spanish). Now you are reading it and probably mentally translating it again, trying to find some clues for the Show. We are privileged, because we can communicate: we are readable, we are visible, we exist. By using a third or a fourth language we may get rid of some determinations, somehow escape the “fascism of language”. But we are aware that this “liberation” is rather a consequence of a previous dispossession. We are condemned to dispossession. What gives us freedom dispossess us, what a paradox. Because every language is a means and a system, a tool and a frame at the same time. And the frame we have to get in is very narrow. We would accept the limitation if we knew the possessions we renounce to they all go back to the collective and we all can decide about their use: about the use of commodities, the use of land, the use of language. But whom does this language we use now belong to? We are interested in opening up spaces where these questions can be posed and explored. 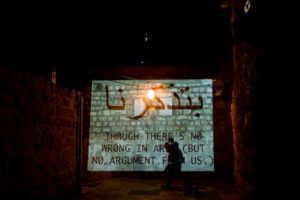 We invited artists to think of the relationship between language and the body, the role of orality and speech as a place of mediation, and the effectiveness or perversion of oral discourses. We can compare, for example, the language of law and the language of poetry, one that is systematised, precise, clear, ordered and compulsory the other associative, deferring, inviting. Both, poetry and law, come and go from the oral to the written and reverse, and in this transit they always go through the body, the social body, but also the literal body of individuals. Law must prevent the arbitrariness and help to fix and support reality. Poetry always works with the unfixed, the metaphorical, the unreal. But we know that poetry may be in some cases more effective than law pursuing true justice and help to build a reality that belongs to everyone, a language that belongs to everyone because it is not imposed and written on the body, but because emerges from the body. The body appears here as a tense space where language can be inscribed and used as a means of taming, or can be disrupted through other acts, such as babbling, laughter, stuttering. What we can not imagine is a human body without language. Even the silent body is already a linguistic body. In the same way that any body is an image before producing any intentional images, human body is linguistic before producing any intentional sign. This assumption prevents from considering any human body as raw matter even when it is not eloquent. And at the same time prevents from considering the body as a white paper where any law may be written. Body is not paper, it is not a medium, it is the source of language, it is language. Paradoxically, the new media (digital video, 3G communications and the internet) brought a new attention to the potentiality of a language attached to the body. In the virtual networks we use communication strategies that are closer to the oral-colloquial than to the written-formal. Language is closer to the body because the medium became liquid. Immateriality became an ally of body. It is interesting to notice that in most futuristic imaginations in film and literature, the material, even the corporeal, is accentuated. Far from disappear, the human body is more evident, sometimes distorted, sometimes oppressed. And of course it is the only being able to speak fluently. 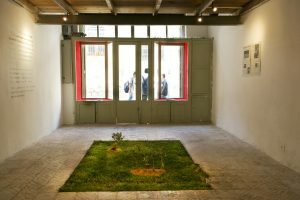 In quite a few art works in the Jerusalem show the imaginings of a future – sometimes a future from the past, which sarcastically is very similar to the present- where language is a focus, and artists have tried to subvert those narratives by either accentuating discourses of intimacy in a future where language is condensed to serve prevalent orders and control, or memorize and preserve language in a world where writing is banned to eradicate memory, or try to delete a physical reality with an attempt of de-writing it. Now, we invite you to join us in these unfinished reflections, to join the conversation, since this text – a language about language – could slip and keep deferring meaning endlessly, we invite you to activate your body in a walk through the city, take a step back and criticize, to think of “pain”, to think of action.